So this project turned out beautiful! And to be perfectly honest the reason is because of the smooth finish of the paint. 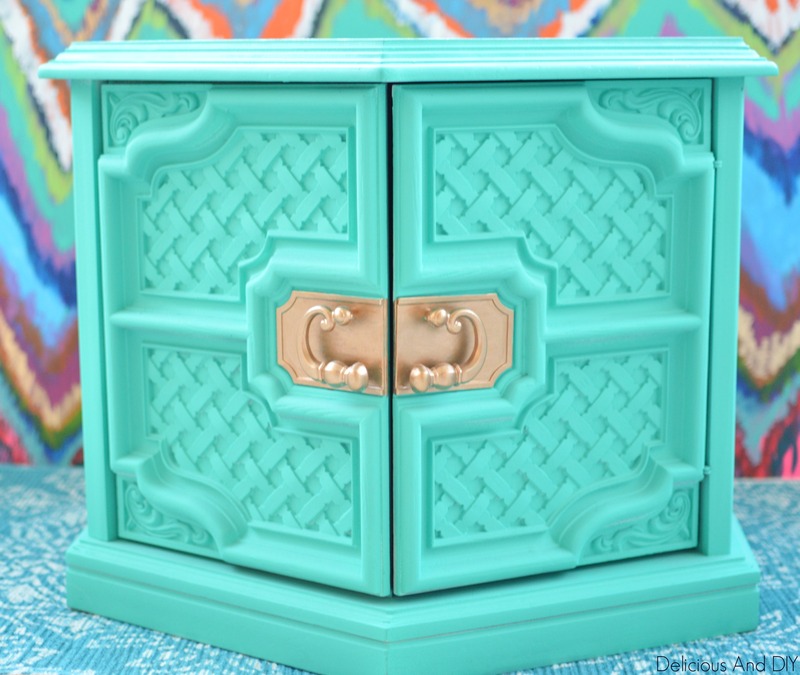 I love bright and bold furniture pieces and in case you are interested then you should definitely start with my 10 of the Most Colorful Furniture Makeovers post. When I saw this table the first time around, I instantly fell in love with it. It had this stunning woodwork mesh on the front plus the hexagon shape of the table was so unique. So let’s start with the Before shot, shall we. It had a couple of scratches on top and a little at the bottom but overall it was in a solid good condition. Plus the price the guy was selling it for was a steal. That meant I just had to have this table in my life no matter what! The key to this amazing transformation is using the HomeRight Finish Max Sprayer. I cannot tell you enough, the perfectly smooth finish that this little guy gives plus you will be done with your project in an hour. Trust me it cuts the painting time in half or even more.I’ve used this on my Southwestern Table Makeover, Moroccan Table Makeover and Coffee Table Gets The Royal Treatment to name a few projects. I sprayed the entire table with one coat of the Primer Paint and things started to take shape. In total I sprayed about two coats until I was satisfied with the way it looked. It took me literally half an hour for me to spray the coats and to get dry. 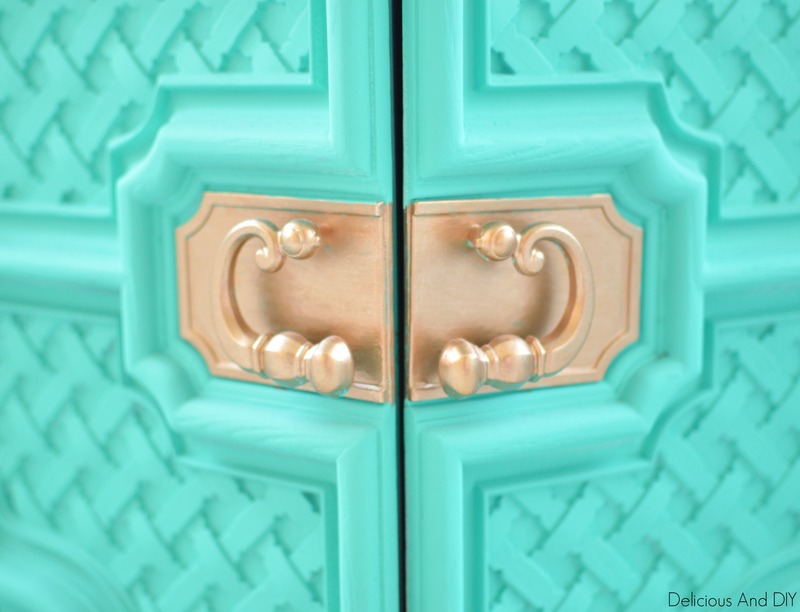 Moving on, I switched the colors to the beautiful almost Mint Green Paint that I had in mind for this project. I just gave it one coat and the whole thing instantly transformed. I did love the color and all but it did need something extra. So I decided to stencil the top of the table and paint the front pulls with my favorite Liquid Gold Gilding. Look at those stunning Gold results. I gave the table a full day to dry before I sprayed the top part with Rust-oleum Clear Gloss Spray. I wanted the entire table to have a matte finish but for the top part only, I wanted it to have a Glossy shine. Just look at that shiny, glossy top. This is SO pretty! I love how it turned out! The table is great! I had a pair of similar tables that were my mom’s from the early 70s. I had them for years, but let them go. Now I wish I had kept them! I had the same thoughts when I was buying these tables that why is this person selling such beauty. But it was a plus for me so can’t complain 🙂 Thanks for dropping by. 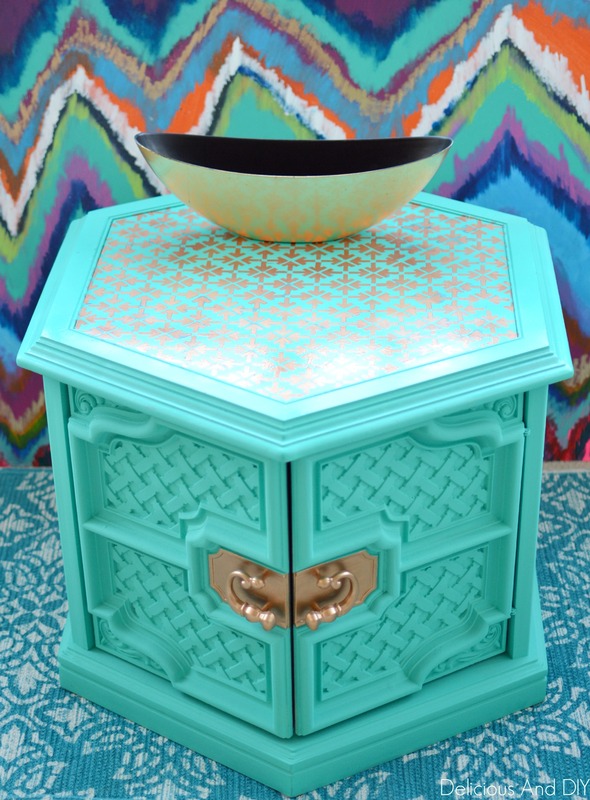 I saw your linkup on the Idea Box, and I LOVE the bright color with the gold accents. Beautiful! What a gorgeous colour. A great find and makeover. Love this idea! And the color! I did something similar, but made it into a little doggy bed! I am visiting from Idea Box today. Very nice detail on top.